Srila Prabhupada lived in a humble setting at the historic medieval temple of Radha Damodara. 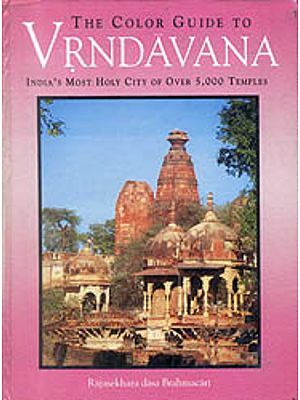 Here, in the holy city of Vrindavan, he accepted the renounced order of life in 1959. At the lotus feet of Radha Damodara Srila Prabhupada began work on his life’s masterpiece: The multi volume, annotated translation of the eighteen thousand verse Srimad Bhagavatam. By leaving the Radha Damodara temple, he brought lord Chaitanya’s sankirtan mission to the world and sparked a spiritual revolution through the chanting of Hare Krishna. When Vishnujana Maharaja would come to a temple, the whole temple become full of light, enthusiasm and ecstasy. I have never seen anyone within our movement who could transform people’s hearts like he did. He was full of that spirit of Bhakti. Vishnujana Maharaja loved Radha Damodara so much. Way he would talk about them, the way he would chant before them, and the way he would serve them just made everyone want to bow down and serve Radha-Damodara. He would reveal their beauty. He would reveal their glories and their mercy to anyone who came in contact with them. His whole life was simply Radha-Damodara and he loved to glorify all the devotees spontaneously.-Radhanath Swami. When Vaiyasaki Prabhu asked me to write the foreword for his book, Radha –Damodara Vilasa, I was overwhelmed with conflicting feelings of enthusiasm and trepidation. Left enthusiasm because I love the subject. Basically the book deals with the history of Vaishnavism came west. it Swami Prabhupada, Particularly in relation to his loved Lordships Sri Sri Radha Damodara the manifestation of Radha and Krishna with whom he has a special mystical relationship (as is brought out in this book). The work also focuses on the early development of the international society for Krishna consciousness (ISKCON) with special attention to the lives of two of its unsung heros: His Holiness Vishnujana Swami and his Grace Jayananda Prabhu, both of whom I had the good fortune to associate with. My trepidation in writing this foreword came from to associate with the enormity of its subject. I remember when Vaiyasaki first told me that Vishnujana and Jayananda, as a theme for his upcoming book. “How will he do it?” I wondered. “There is so much rich material such deep theological implications in each of these subjects –this s a major, herculean task and I’m glad I’m not taking it on. I could never do it justice.” And yet Vaiyasaki has one a splendid job. Going through his manuscript, I see that he has not only researched the subject with the expertise of a master historian, but he has captured the emotional component of the lived of Prabhupada, Vishnujana, Jayananda and the many devotes who surrounded them. My diverse feelings in writing this foreword then are grown from the same seed and in this sense this sense they are simultaneously one and different. I wanted to do it because of my deep regard for the subject but I was hesitant to do it for the same reason. This dichotomy of feelings is just the kind of world of opposites I experienced in the lives of Vishnujana and Jayananda the book’s main protagonists. Take Vishnujana for instance. To me he embodied the best of the aisvarya/ madhurya dichotomy. In Gaudiya Vaishnava theology, aisvarya represents the majesty of God that aspect of the supreme that evokes awe and reverence. Madhurya on the other hand represents the sweet nature of the lord, that that quality in God that enables the devotee to relish an intimate relationship with him. While these terms are generally applied to god and his relationship with devotees, the same terms are sometimes used in general way, to describe the moods they embody. In Vishnujana this later definition is clearly invoked while he had a certain noble quality a quality that seemed regal and timeless evoking deep respect from those who knew him he simultaneously had this sweet charming almost innocent side; he was warm and friendly too. So you felt this mood of awe and reverence while at the same time he seemed like your best friend. As I remember him, Jayananda, too, had a personality that evoked seemingly contradictory feelings. On the one hand he was as humble as a person could be. Especially among younger devotees, he was as gentle as a kitten. He was the kind of guy you would find working under a truck or taking out the garbage even though he was given a position in major ISKCON temple as temple president. When he could have just sat back and taken it easy, he felt that he needed to work hard that he was so fallen that if he didn’t he would never make any progress in Krishna consciousness. On the other hand he knew for certain that he had found the truth. So while he was humble in his personal demeanor, he became almost ferocious if you questioned Prabhupada or the disciplic succession. Not that he didn’t appreciate good sincere inquiry. But if your mood was challenging, watch out! Jayananda wouldn’t tolerate it. The kitten would become a lion. 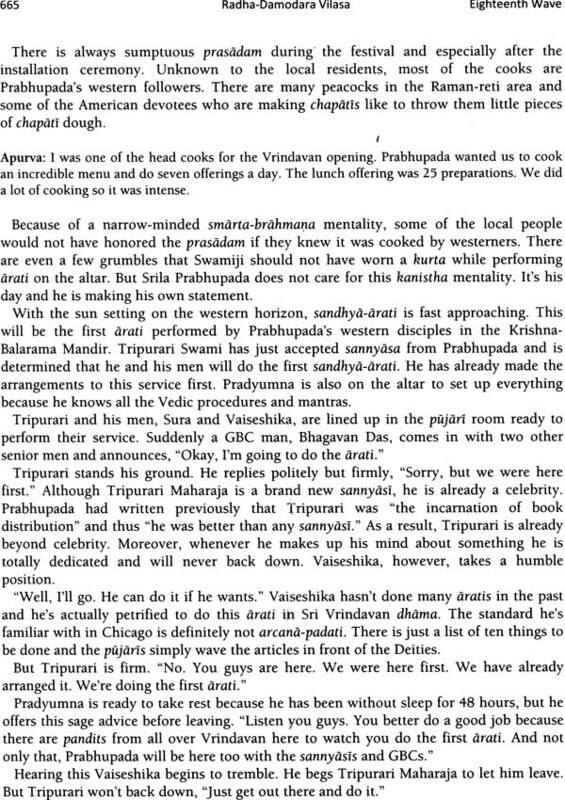 I am delighted to see that these diverse characteristics come out in Vaiyasaki Prabhu’s book. The primary mystery of Gaudiya Vaishnavism Sri Chaitanya Mahaprabhu is said to be Radha Krishna combined-the Male and female Moiety as Bhaktisiddhanta Saraswati has expressed it- in one body. The full-fledged conception of “unity in diversity” is expressed in Sri Chaitanya’s doctrine of Acintya-bhedabheda-tattva, or” the inconceivable simultaneous oneness and difference of God and the living being.” Although this theological term is generally reserved for man and his relationship with God there is another aspect of this truth that comes out in Vaiyasaki’s book: While the ISKCON universe will always have Prabhupada at its center, Prominent devotees such as Vishnujana and Jayananda (Who form major constellations around him), are also significant parts of the hare Krishna cosmos. Or, to put it another way the sun’s full meaning is understood when one feels its warmth and heat. Prabhupada may be compared to the sin and his stalwart disciples are like the rays of the sun extending heat and lights to others. Although Radha Damodara Vilasa does indeed glorify Prabhupada and his accomplishments, some may criticize that in this book Vaiyasaki is elevating Vishnujana and Jayananda to an unnecessarily high position sometimes even eclipsing that of their spiritual master. Not so. A close reading of this work reveals that the many good qualities of Vishnujana and Jayananda were nurtured by Prabhupada himself and that these qualities have little meaning without Prabhupada’s mission. Vishnujana and Jayananda are like the rays of the sun, which would not exist without the sun itself. In one sense the sun and its rays are non-different, for each gives the other meaning. What is the value of a sun it if does not give off light and heat? And while certain great devotes are glorified in this work, Prabhupada’s unique position is always maintained. Every genuine movement attracts persons who stand out by their acts of selfless sacrifice. In the Hare Krishna movement, Vishnujana Swami and Jayananda Prabhu were two such persons. Their spirit of humble service and commitment spreading the glories of the Holy name of the Lord left an indelible impression on everyone who met them. Each becomes a legend in his own time. Vishnujana Swami was active in devotional service for only eight years and Jayananda for only ten before each passed from our vision. They left behind no disciple a book any temples. This book is humble attempt to properly glorify these outstanding devotes. The goal is to preserve their place in Vaishnava history so that succeeding generations may know of the important roles they played in helping Srila Prabhupada establish Lord Chaitanya’s mission worldwide. Although saintliness is rarely achieved, Vishnujana Swami and Jayananda Prabhu have been acknowledged as saintly by the people who knew them. The following personal memories us a brief look into the character and personality of these two great saints. Jayananda Prabhu was always ready to do whatever was necessary to push on Krishna consciousness. He was expert at everything cooking, preaching, Deity worship, public relation, sankirtan, selling incense, construction, and everything else it takes to run a temple. He was tireless worker. her would be the first one up n the morning and the last one to sleep at night. It was Jayananda who was always running out to get the flowers, Jayananda who was washing dishes and making he was out to get the flowers, Jayananda who was often missing class while he was out doing some service and Jayananda who was always encouraging others to go out and preach setting the example himself. Whatever assignment he was given he would always get it done even if he had to suffer personal inconvenience. Those who knew Jayananda always noticed one remarkable quality about him: he could not criticize others. It was against his nature. Even if a devotee did something that warranted criticism, Jayananda would usually say nothing or else say something that made the mistake appear to be perfectly understandable. No matter who was giving class or leading kirtan, he would always appreciate it. He never spoke harsh words or chastised anybody. If one devotee was criticizing another earshot of Jayananda, Jayananda would simply leave. Rather than criticize others, Jayananda would contribute nothing less than positive Krishna conscious energy to any situation. Sometimes devotees would bring up their expansive aspirations for spreading Krishna consciousness Jayananda would always encourage their ideas however extraordinary. At the same time he was not a fool. He could always pick the right man to do a particular duty. Because he knew how to encourage people the temple leaders would always assign new men to work with Jayananda. He saw no distinction between new man a sense of identity and a feeling that he belonged in Krishna consciousness. A true Vaishnava he would expertly fan any little spark of interest into a big fire of Krishna consciousness. Like the Six Goswamis Jayananda was “dear both to the gentle and the ruffians.” He was as much at home with the Italians at the produce market as with brahmacaris in the temple. Because of his genuine compassion, Krishna gave Jayananda the unique ability to make people want to serve, directly or indirectly. Whenever a new Bhakta would come, Jayananda made him feel that he was engaged in important work. He was willing to let people do things their own way, without getting finicky about details-unless somebody’s creativity interfered with practical necessity. New Bhakta or old everyone felt satisfied after a day’s work with Jayananda. Jayananda leadership was especially evident during Ratha-yatra time. He would organize a crew of cynics, bloopers, uncooperative personalities, and nondevotees off the street to build the Ratha-Yatra carts. Although many of his men sat down for a smoke during breaks he would get them to work, ten, twelve, or fourteen hours a day. He was always glorifying others, while working hard himself. In fact he worked hard than anybody else. All these qualities constantly inspired his co-workers. Jayananda was well known as a transcendental miser. He hated to spend any of Srila during his years as a householder. Jayananda would use his personal charm with people to get them to give everything for free, or at a discount, for Krishna. Without spending huge sums of money, he would personally collect nearly all the bhoga, flowers, lumber, print and everything else needed to put on Ratha-Yatra each year. Jayananda would get almost anything done for free, such as printing advertising and mimeographing for Ratha-Yatra publicity. What he couldn’t get for free, he’d get at a discount and when he said he’d get his money’s worth. Although he was a senior devotee and could have had anything he wanted, he always dressed in old dhotis, or work clothes that he’d buy for one dollar per set at the Salvation Army. 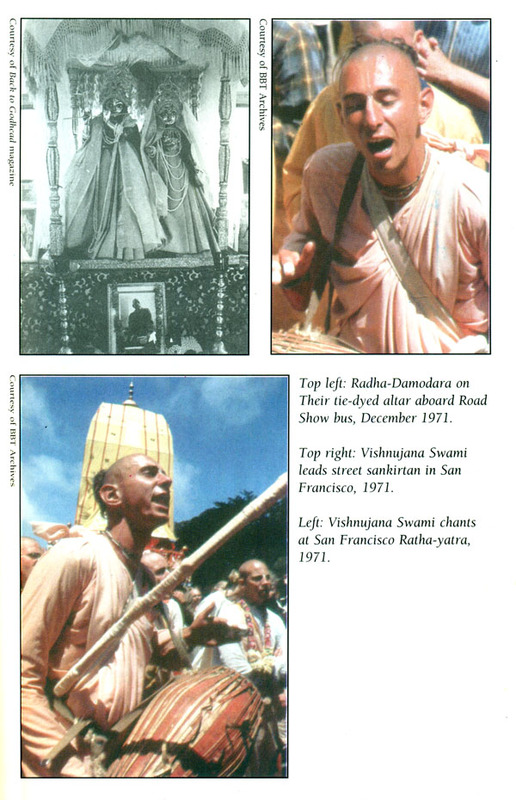 Jayananda was the back bone of the Bay Area Ratha-Yatra for years. During the weeks before the festival, Jayananda would sleep at the site where the Ratha-Yatra carts were under construction. He would rise every day 4.00 A.M. without fail, even of that meant he was getting less than three hours of sleep. To keep his crew enlivened he would cook fantastic prasadam on a tiny gas stove at the site. The preparations were always carefully offered, and each was filled with so much devotion that the temple devotees would sometimes sneak down to the cart site just to get some. Behind the scenes Jayananda was doing everything in preparation for each festival. He would beg food, flowers, and funds, buy material and build the carts, advertise and arrange for permits and organize the cooking and serving of Prasadam. Although things always went right down to the wire, he consistently succeeded in fulfilling all his plans. After the festival, Jayananda personally brought a prasadam cake or pie to each and every person who had helped in some way. Because of his efforts, the devotees i the Bay Area have enjoyed an amazingly harmonious relationship with the city officials. Jayananda was very eager to see everyone engaged in Krishna’s service. He once wrote, “When I reflect on my consciousness, had I not had association with devotees and Srila Prabhupada, I shudder to imagine the nightmare I would be in. If we could become a little dedicated to distributing the many could be saved so much suffering”. Vishnujana Swami impressed everyone with his unique” adult as spiritual child” persona. This was mixed with a natural unpretentiousness, and so it was not at all difficult to imagine him reincarnated from a character residing somewhere between the Pied of Hamelin and peter pan. As the story goes, Peter pan nourished those he met the fountain of youth. He rejected all things adult, and everyone felt drawn to his youthful energy and attractiveness. Peter Pan symbolized the indefatigable spirit, and he awakened the child within all he touched. The pied piper for his part enchanted the children of Hamelin with his rainbow robes and flute which played the notes of happy laughter and merry play. All the children of the town joyfully skipped and danced to the pipe’s call following him and disappearing into the green wood. Anyone could see that Vishnujana this Pan/ piper character had finally received the blessing of all his good works and has taken that jump from the mode of goodness to transcendental life. Here he was his elfish garb replaced with the beautiful robes of a young sannyasa his forest songs upgraded to heartfelt bhajans for Radha Krishna. His playing of ancient Indian instruments like the mournful esraj, now provided an otherworldly background and an added poignancy to his emotional cries. What’s more in this life the merry piper surrendered the flute playing and the flute itself to the Supreme player Lord Damodara. Now he himself dances to Damodara’s flute and induces all to dance to His lead, Vishnujana naturally seemed to turn everything even menial activities, into exciting adventures, and in that sense, it was also easy visualizing his as a cowherd boyfriend of Krishna surely a group leader who plans out daily fun mischief in Goloka. I crossed paths frequently with traveling Road Show that amalgam of devotes, musicians, actors, book distributors, cooks, mechanics and preachers, headed by Vishnujana Swami Kirtanananda Swami, and above all, Sri Sri Radha Damodara. Aja was doing his “You know you’re not that body” routine along with the rest of the troupe and Radha Damodara were resplendent in elegant beauty on stage overseeing the festivities. One of the amazing highlights of the show was Vishnujana performance-but he wasn’t acting. His uniquely attractive qualities were fully in evidence one day on a university campus. Vishnujana gave one of his inspiring talks on the glories of Sri Sir Ra-a-a-dha Da-a-a-mod-a-a-ra”, that deep, forever hoarse, lustful for Krishna voice of his –imitated but never equaled drawing everyone to rapt attention. He clearly communicated the excitement and adventure of serving Krishna and then, almost as if it were a right of passage to begin life within that higher consciousness he raised his arms high and, in his best voice beckoned everyone to bow down to their Lordships. And just like that everyone every single authority despising collage hippie and arrogant professor alike all got down on their kness and touched their heads to the ground in obeisance to Radha Damodara. Vishnujana inspired the instinctual feeling that this was simply the best possible thing to do, and also the coolest possible thing to do, at that moment. it was unspoken, but not to do so would obviously mean missing out on a most rare opportunity, something beneficial to the self to the ultimate degree. So even though many there really didn’t understand what was happening, their hearts brought them to their kness. Again this transcendental Pan/Piper figure was leading us to the real magic land. Sri Radha Damodara were blessing their devotee Vishnujana Swami to cast a joyful spell on all and for a few moments everyone knew that they were eternal devotees of Krishna. It was a moment of great comfort and communal peace everyone there felt it. Vishnujana was that kind of conduit. He had many gifts and he was using them in the highest way: to attract and awaken the lost souls to the realization of their identity: It was wonderful to see Krishna plainly working through His surrendered devotee to such effect. I met Vishnujana many times in India and his sweet and unpretentious kirtans and dancing in Mayapur and Vrindavan were wonderful to be a part of. But to me, it seemed that Vishnujana Swami was at his best and fully in his element as a sannyasa preacher to the young seekers of America. He made surrender look easy. And because his devotion was so natural, he was most effective. He seemed literally designed by Lord Damodara for this purpose. Those of us who heard him sing and saw him dance and express his uniquely attractive praise of Radha Damodara felt fortunate indeed to be bathed in the devotional light of this sincere and brilliant Soul. The Vedic scriptures teach that the supreme personality of Godhead appears in this world to encourage us to begin the mystical process of devotional service. One way in which he descends is in his Deity or murti form. Although we cannot see his original form of pure spirit, we can, by his mercy, see His Deity from in the temple. Devotees, therefore, offer worship and loving service to Him in this form as intensely as they would His original form in the spiritual world. In the early days of the Hare Krishna movement in America, Sri Sri Radha–Damodara were the first Deities that most people ever saw. This was because Radha Damodara did not remain confined to a temple building. Instead, since their temple happened to be a bus, they were constantly on the move. There are historical precedents for this. Lord Jagannath, by His infinite mercy comes out of the temple every year for Ratha yatra. Those who see Him on this wonderful day serve Him in diverse ways including chanting, dancing, or pulling his chariot. But Radha Damodara lived in the road for over six years on a bus converted into a traveling temple. Rather than wait for people to come to see Them, They were Deities who went out to engage sincere souls in Lord Chaitanya’s sankirtan movement. This was unprecedented in the history of Gaudiya Vaishnavism-indeed, in all history. “In every town and village around the world my name will be sung.” The ups and downs of life on the road were not only experienced by the devotees, but Radha Damodara compassionately encountered these hardships as well just as the Lord in the heart witnesses the trials and tribulations of every living being. In keeping with their prankish mood and displaying their sense of humor, Radha Damodara descended in their sri murti forms to join the fun and help us accomplish Their goal. It is stated that lord Chaitanya is the is the combined form of Radha and Krishna. In the way Lord Chaitanya by His inconceivable potency came to fulfill his own prophecy. The readers of Radha Damodara Vilasa relive this sankirtan mood through the lives of three of Prabhupada’s most influential disciples Jayananda Prabhu, Vishnujana Swami and Tamal Krishna Goswami joined the San Francisco temple within the first year of its opening in the mid’ 60s. Together they helped establish Lord Chaitanya’s mission in California while inaugurating the first traveling sankirtan party in the western world. After less than two years of preaching and touring together, however, they were separated by destiny. Five years later were reunited by Sri Sri Radha Damodara as leaders of a sankirtan party dedicated to distributing the mercy of Lord Chaitanya to every town and village. In the years leading up to this they had grown and changed in their own ways. All three played significant roles in spreading the sankirtan movement while undergoing personal struggles and triumphs in their endeavor for enlightenment. After Jayananda’s passing a away, Srila Prabhupada confirmed that he went back to Godhead. He was considered ISKCON’s first saint-an average American who perfected his life. 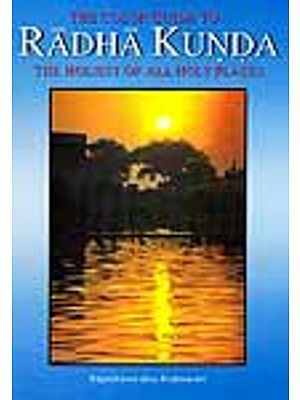 Radha Damodara Vilasa is therefore a sankirtan adventure saga tracing the history of the fulfillment of an ancient prophecy- to bring the Holy Names of God to every town, village, and City Street throughout the word. Just as Lord Ramachandra engaged and army of monkeys to liberate Srimati Sitadevi, Similarly Srila Prabhupada recruited an army of the sons and daughters of the mleccha and Yavana countries to fulfil the prophecy of Lord Chaitanya. Attracted by Srila Prabhupada’s purity and love for Krishna, Young people from all walks of life embraced his teachings and took to the path of self-realization. As he gradually introduced deeper truths of Bhakti- yoga, Prabhupada imbued his disciples with greater spiritual fervor empowering them to travel the glove to spread the gloried of itual fervor empowering them to travel the globe to spread the glories of the holy Name and to establish temples along the way. The Radha Damodara party was the largest traveling sankirtan army the world has ever seen comprising six buses with numerous satellite vans and cars that crisscrossed the North American continent. They distributed millions of transcendental books and inspired other parties around the world to do the same. All of a sudden in early 1976, Vishnujana Maharaja mysteriously disappeared. By the end of the year Tamal Krishna Maharaja left the party to be with Prabhupada in India. 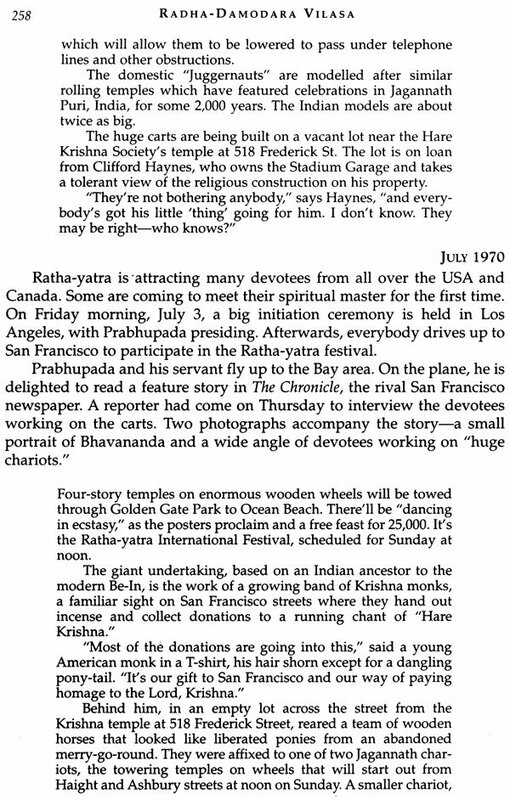 By May 1977, Jayananda Prabhu contracted leukemia and passed away but not before staging the first New York Ratha-yatra and inaugurating the Los Angeles Ratha-Yatra. Radha Damodara retired from traveling during the summer of 1977 and settled at the farm Prabhupada had a plan to visit Gita Nagari to implement what he called the second 50% of his work varnasrama-dharma. It was to be his last journey abroad. He was in Poor health and at an advanced age. 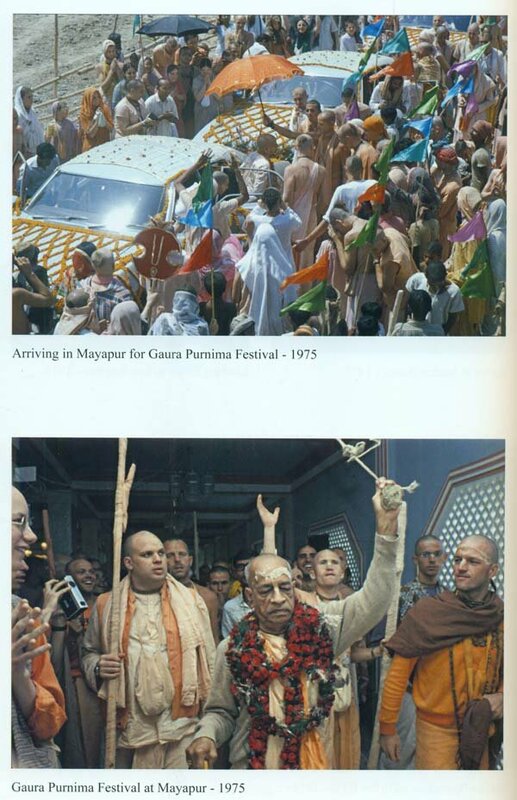 En route to Gita Nagari, Prabhupada stopped in London, where his condition became critical. He had to cancel his plans and returned to Vrindavan. Srila Prabhupada passed from our vision at the age of 81 on November 14, 1977, sending shock waves throughout the Hare Krishna movement that are still felt today. Srila Prabhupada always had an intimate relationship with Radha-Damodara. For years he lived at the Radha-Damodara Mandir in Vrindavan, where he had written his Srimad Bhagavatam purports under their shelter. Prabhupada told us that he lives eternally at Radha-Damodara temple has requested that we continually venerate his rooms there. Radha-Damodara were also the beloved Deities of Srila Rupa Goswami and Srila Jiva Goswami. These two eminent Acharyas were dedicated to spreading the mission of Lord Chaitanya worldwide. Srila Prabhupada had regularly prayed for the mercy of these Acharyas whose life and soul were Radha-Damodara. When Prabhupada suffered a heart attack on his maiden voyage to America he wrote the following in his diary: “I feel better today, but I am feeling separation from Sri Vrindavan and my Lords, Sri Govinda, Gopinath, Radha-Damodara”. By leaving the Radha-Damodara temple in Vrindavan he brought Lord Chaitanya’s sankirtan mission to the world and sparked a spiritual revolution through the chanting of Hare Krishna. 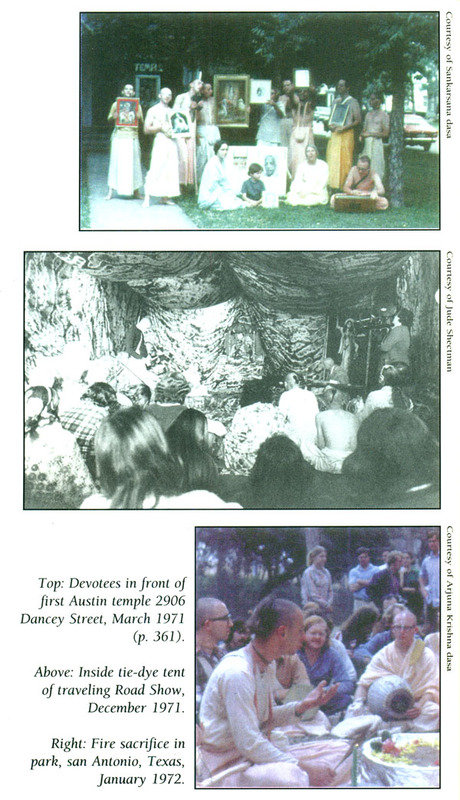 In its initial four years from 1966 to 1970 the Hare Krishna movement was spread primarily by householder couples. 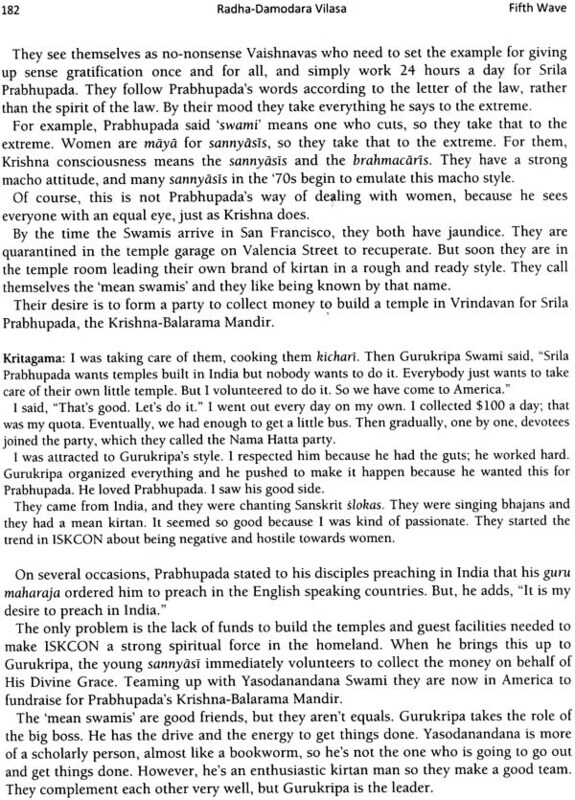 Prabhupada would send them to a city to start a Krishna conscious center, usually in a storefront or a house. The Deities in those centers were always Lord Jayannath murti. If a center didn’t have Lord Jagannth murtis, then devotes worshipped a picture of Panca Tattva. The first large Radha Krishna Deities in the movement were installed in December 1969. At the same time Prabhupada left America to establish temples in the holy places of Vrindavan, Mayapur, and the important cities of India while Prabhupada was returning to India, Radha-Damodara were coming to America. There are external and internal reasons for the advent of Radha Damodara. The internal reasons are for their own purpose, which remain mostly inconceivable. The external reasons for Their appearance are essentially for the benefit of others –for our benefits. But in either case whenever they descend everybody benefits. The main them of our story, therefore, portrays the advent and unparalleled pastime of Radh-Damodara with their gradually reveal a plan to fulfill the mission of Lord Chaitanya. The supporting them of our story describes how the surrendered souls disburse the Lord’s mercy and inspire others to participate, thus facilitating the conditioned souls’ exit from the material world. Krishna is famous for speaking the immortal Bhagavad-gita to his devotee Arjuna, thereby re-establishing eternal dharma for the benefit of future generations. But He is no less famous as Damodara, the naughty child of mother Yasoda and in these pastimes He reveals even more about Himself and His intimate relationship with His devotees. The Sanskrit word damodara is actually two words dama and udara which mean “rope” and “belly” respectively. The Yasoda-Damodara pastimes are part of Krishna Maintainer of the entire material and spiritual existence assumes the form of a child, voluntarily placing Himself in the care of his devotees as if helpless without their love. Under the influence of the potency Yogamaya mother Yasoda and Nanda Maharaja feel that child Krishna will come to harm without their tender loving care. When child Krishna is bound with rope around his belly by the love of mother Yasoda, the Lord becomes eternally famous as Damodara. By agreeing to be bound by mother Yasoda’s love Damodara displays a unique quality bhakta vatsala whereby the supreme agrees to become subordinate to his devotee in the mood of loving reciprocation. This is a particularly sweet role for the supreme controller as well as for the devotee. Vaishnavas aspiring for this pure devotional mood cherish the Damodara pastimes as exquisitely attractive. The poet Satyavrata Muni captures this attitude of devotion in his Sri Damodarstakam, eight Sanskrit verses that have been sung with great feeling for millennia. A benediction accompanies these verses. It is said that anyone who recites or even hears this prayer especially in the month of Kartik, will attract the eternal shelter of devotional service at the lotus feet of Sri Damodara. The super-excellent pastimes of mother Yasoda with child Damodara portray the loving mood of vatsalya-rasa. But what is the role of Damodara with Srimati Radharani whose relationship with Krishna is in madhurya-rasa the sweet delicacy of conjugal love? What is the significance of Radha-Damodara to the Gaudiya Vaishnava sampradaya, which emphasizes madhurya-rasa? The vraja-gopis constantly discuss Krishna’s pastimes amongst themselves. Since mother Yasoda never wants to forget Krishna’s activities, she remembers all His pastimes in the form of poetry. “One day when mother Yasoda saw that all the maidservants were engaged in other household affairs, she personally began to churn the yogurt, while churning, She remembered the childish activities of Krishna and in her own way the composed songs and enjoyed singing to herself about all those activities. All the gopis love to hear Mother Yasoda sing about the glories of Krishna. Radharani is especially keen to hear Krishna’s pastimes, but She is particularly attracted to the Damodara pastime. Charmed by Damodara’s mood of surrender in agreeing to be bound by mother Yasoda’s love, Sri Radha longs to have that same exchange with Krishna. She desires to express such intense love for Krishna that he will also agree to be bound by her love. Appreciating this mood of mother Yasoda to enhance her own feeling for Krishna, She resolves to experience this same reciprocation of love. Srila Prabhupada states, “This position of Mother-Yasoda is the greatest.” And he adds that, “Mother Yasoda is in the super-most exalted position, and thus Krishna has become completely subordinate to her. 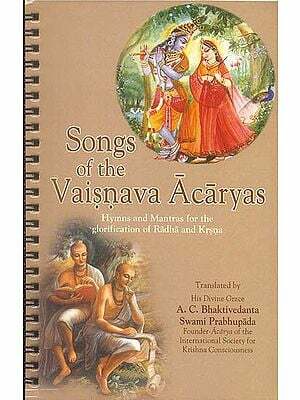 A full decade has passed since the release of Radha-Damodara Vilasa, Volume One, a momentous book that documented the journey of Radha and Krishna - the Supreme Lord and His eternal consort in Their forms as Sri-Sri Radha-Damodara - to the Western world. That journey was facilitated by the loving, herculean endeavor of His Divine Grace A. C. Bhaktivedanta Swami Prabhupada, Founder-Acharya of the International Society for Krishna Consciousness, and augmented by the charisma, devotion and talents of two extraordinary individuals, Vishnujana Swami and Jayananda Prabhu, among others. The initial stages of this spiritual journey were effectively and dramatically portrayed by Vaiyasaki Das in the first volume, which garnered much praise from various quarters, especially from the community of devotees. That being the case, I now feel justified and gratified in writing that volume's glowing introductory notes. The days I spent on that prefatory essay bore incredible fruit. Those days blossomed into months and years, as days normally do, and, today, I find myself being asked to write such notes again - this time for what will be Volume Two of a trilogy. And because of the considerable moments that have elapsed between the publication of the first book and that of the second, I find myself thinking about time and space, and about how they impact an epic of devotional history like Radha-Damodara Vilasa. Time is mysterious: In some cases, it changes things drastically. Milk sours; flowers wilt. People age and die. From another point of view, though, it's as if time simply does not exist at all. St. Augustine, espousing a subjective view of time, said that it embodies little that has anything to do with reality. It exists, he said, only in the: mind's apprehension of reality. In the 11th century, the Persian philosopher Avicenna doubted the existence of physical time altogether, opining that time only exists because of memory and expectation. Others have argued convincingly for both physical and psychological time, at least in the material world. And the scriptures have their own story to tell: In the spiritual realm, time is conspicuous by its absence. The subject of Radha-Damodara Vilasa transcends time - in a sense. It focuses on a spiritual movement that, in its essence, goes beyond the limitations of all things material. And it is about individuals who, though their activities and accomplishments are constricted by past, present, and future, also stand outside the normal boundaries of time. How is this so? The answer is disarmingly simple: The work of this movement and of these particular individuals is spiritual, and so even though the movement goes through numerous permutations, both good and bad, and the individuals - especially Vishnujana Maharaja and jayananda Prabhu -lived and died, apparently like so many others, they largely functioned in a transcendent realm, even while in the flesh. They contributed to a world that is immortal and supreme. Indeed, their activities were gently molded, as well as orchestrated, by the hand of God. They functioned within sacred space, revealing glimpses of the spiritual kingdom in their life and work. They fully embody the mystery of time, transcending it while, externally, submitting to its fearsome call. No one in the material world can escape time. Nor should they want to. Time is, after all, a form of Krishna. And to submit to time properly is to submit to the Lord and His service. Otherwise, one merely goes sour, like milk, or wilts, like a flower. Not so for the pure devotee and his associates. For him (or her) life springs eternal, and while going through the motions of one subjected to time and space, such personalities live a life of ever-increasing bliss. 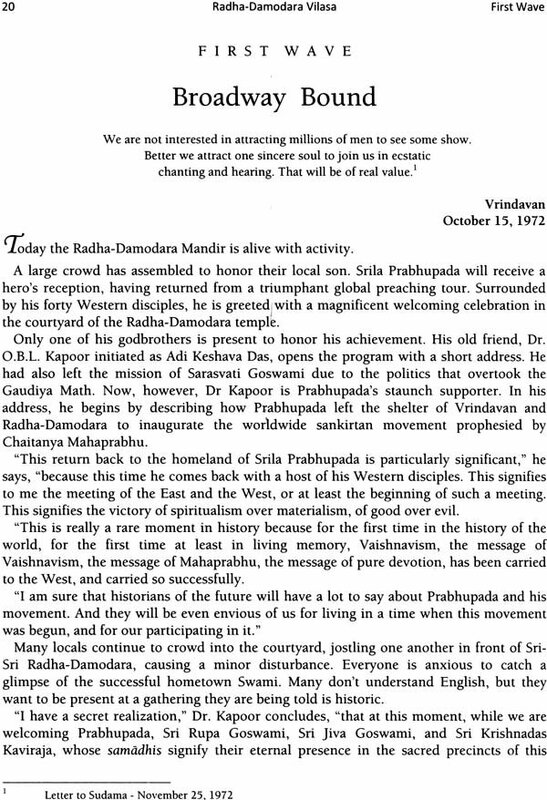 Such a life of "timeless time" engulfed both Vishnujana Maharaja and Jayananda Prabhu. Here, in Volume Two, Vaiyasaki Das illustrates this quite clearly. The volume picks up where the previous one leaves off. 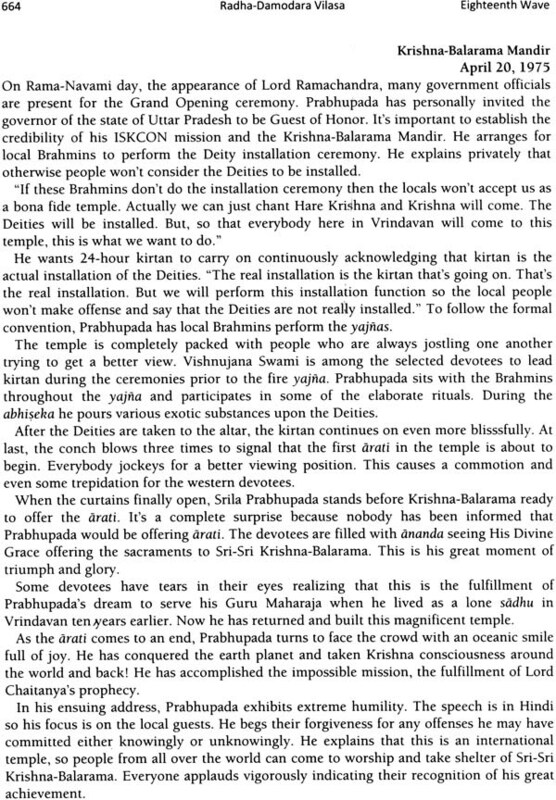 It is fall of 1972 - as if its subjects are functioning within the precincts of time - and we find ourselves sharing "time" with Srila Prabhupada in the holy land of Vrindavan, a land that is clearly beyond the limitations of past, present, and future. Vaiyasaki brings us there in his own inimitable way, virtually transporting us to Krishna's holy abode. From there, we are brought to North America, where the Divine Couple - and their superlative devotees, the main protagonists of this book - extend their blessings to all who would receive them. We learn that Sri-Sri Radha-Damodara are the ultimate Sankirtan deities, unable to sit in one place, as other immobile manifestations of the Divine tend to. Rather, by the grace of Vishnujana Swami and later, Tamal Krishna Goswami, They seek to share the divine truth of Their existence with one and all. They live on the road with their devotees, inspiring Their glories to be sung by experienced practitioners and by newcomers alike. They watch magazines and books go out, and, as a result, new seekers come in. Vishnujana Maharaja is at the helm, bestowing Their mercy through his shining example and mellifluous voice. Tamal Krishna Maharaja works closely with him, complementing his soft, endearing qualities with practical know-how, scriptural knowledge, and a sense of gravitas. 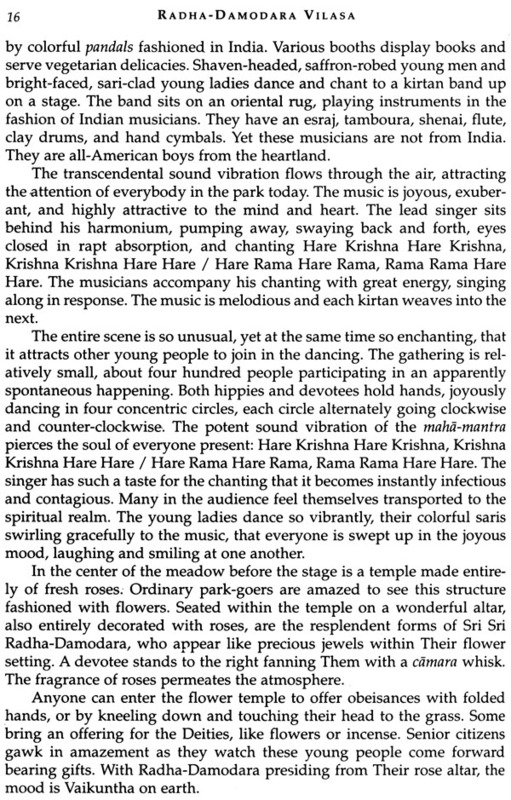 Jayananda, too, inspires this magical experience, but mainly through building magnificent festivals and helping fledgling devotees. Whereas Vishnujana Swami took to the streets overtly, with literally buses of devotees traveling the continent, Jayananda stuck more closely to ashrams and temples - yet outreach was his forte, too. 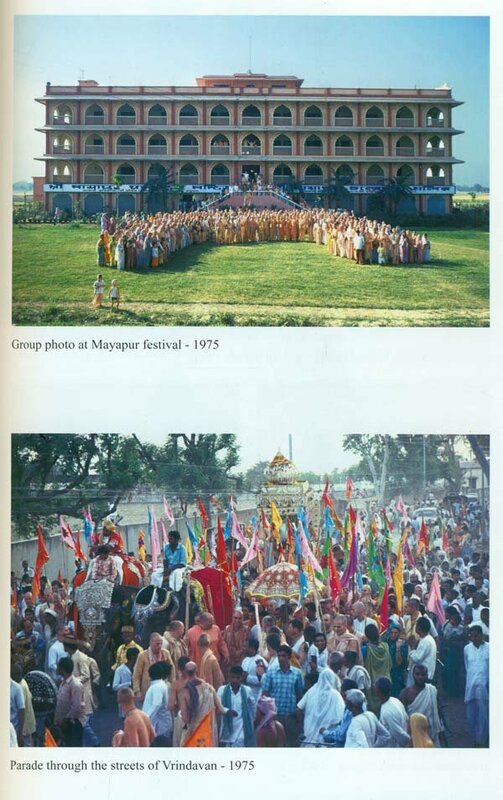 Ratha-yatra and other outdoor festivals were his way of bringing God to the masses. Both he and Vishnujana Swami, then, shared a passion to help Radha-Krishna in Their mission as Radha-Damodara, that is, to perform Sankirtan - to reach out to people, both inside and outside of ashrams, and to give them Krishna consciousness. As such, Vaiyasaki Das's book is a literature of exemplars, displaying the ideals of a community as much as the events of individual lives. Vishnujana Swami and jayananda Prabhu are no doubt the main models for the religious life as portrayed in the book you now hold in your hands, even if their exemplary behavior is predicated first on Prabhupada and his superlative example. 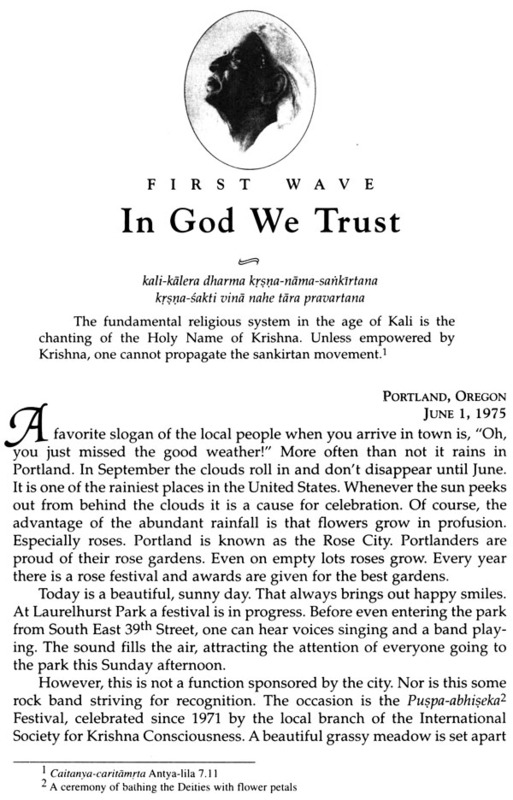 This should be perfectly clear: While our two protagonists are center stage in this particular series of books, it is never far from the author's mind that they are flawed, human individuals, and that their "perfection" is precisely in their ability to take shelter of a pure devotee of the Lord, in this case, Srila Prabhupada. This truth is implicit in nearly every page of this book. As the years have passed, Vaiyasaki prabhu has himself developed a reputation as a kirtan singer of respectable renown, both inside and outside the community of which he is a part, and since the writing of the first volume, his realizations and insights have developed considerably. His own ability to take shelter of his spiritual master, Srila Prabhupada - the same teacher who so inspired both Vishnujana Swami and Jayananda Prabhu - has grown with the years. Time can do that. A life lived properly helps one progress on the spiritual path, no doubt. And a person who lives many years pursuing the spiritual path in earnest will generally be closer to the goal than a fledgling devotee. Not necessarily, but generally. Although spiritual advancement is not limited by time constraints, a seasoned devotee, an experienced practitioner, can usually access inner regions more effectively. More accomplished, more practiced, such a person brings long-cultivated virtues to the table. Vaiyasaki Das does this in his own life and in Radha-Damodara Vilasa. Because of this, his work will stand the test of time. Indeed, Radha-Damodara Vilasa transcends time, as I stated earlier, for it embodies the best that the spiritual world has to offer. By the mercy of Lord Chaitanya Mahaprabhu, even a foolish child can fully describe the real nature of Lord Krishna, the enjoyer of the pastimes of Vraja, according to the vision of the revealed scriptures. I CC, Adi 4.1] For a long time people have asked, "When is the second volume coming out?" And now it is in your hands! It was of utmost importance to research and interview eye-witnesses, because a book about Prabhupada and his disciples must be accurate and devoid of errors. Mahamaya Dasi wrote something terribly wrong about Vishnujana Swami in her book. I was shocked and questioned her about it. She replied that it was what she remembered. I asked her if she had doubled-checked with the memories of other devotees or done some research to determine that what she wrote was actually true. She said no, she relied on her own memory. To avoid the pitfalls of relying on only one person's memory, I have done extensive research for the volume you are now holding. That's one reason the book has taken so long to come to print. The second reason is that I'm always traveling and preaching. Moreover, there is no one to assist me because I do not accept disciples, so this work is basically one man's endeavor. Both the families of Vishnujana Swami and jayananda Prabhu received copies of the first volume of Radha-Damodara Vilasa. Vishnujana Swami's sister, Theresa, sent me a wonderful letter of appreciation. One of her comments was, "You must have researched up to the point of exhaustion." And it was true. I was meticulous in presenting all facts as fully authoritative and accurate. I did not merely rely on the memories of individuals, but cross-referenced and double checked everything to the best of my ability. I have continued that practice in the present volume. As Sri Krishna states in the opening verses of Bhagavad-gita, Chapter 6, a sannyasi is a person who is dedicated to spreading the teachings of bhakti-yoga. Srila Prabhupada ordered me to share what I knew about Krishna consciousness wherever I went, therefore sitting in one place to write was not an option. So in my travels, I promote Prabhupada's mission and write, by his mercy. If I had remained in one place I could have finished much quicker, but I didn't have that alternative. In the first volume there weren’t much of Vishnujana Swami's actual lectures, but the readers of Volume One were struck with wonder to see how Vishnujana Swami presented Krishna consciousness in all kinds of circumstances. Soon, people began to record his talks because they were far beyond the realizations of his peers. So in this volume you can actually hear Vishnujana Maharaja preach Krishna consciousness, and you will be further impressed. 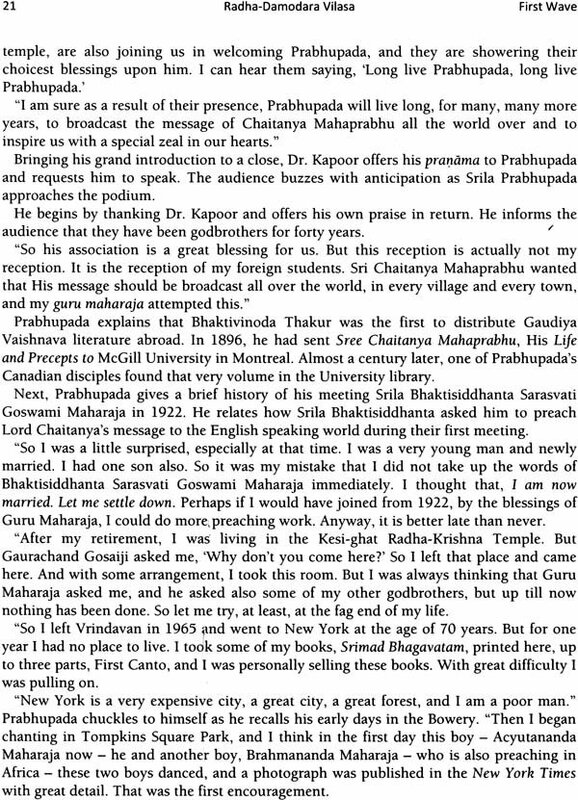 As a devotee for only 5 years, Maharaja preaches at a level that only a few rare disciples can do today, 35 years later. At a high school in Portland, Oregon, the reader sits beside Vishnujana Swami as he presents a slide show describing the qualities of a bona fide guru. Everyone should know the actual qualities of a spiritual master so they can choose a guru based on knowledge, not on sentiment. He also describes the qualities of a bona fide disciple. He goes on to describe all aspects of life in the practice of bhakti-yoga, including marriage, renunciation, sadhana, Deity worship, and returning back to the spiritual realm. 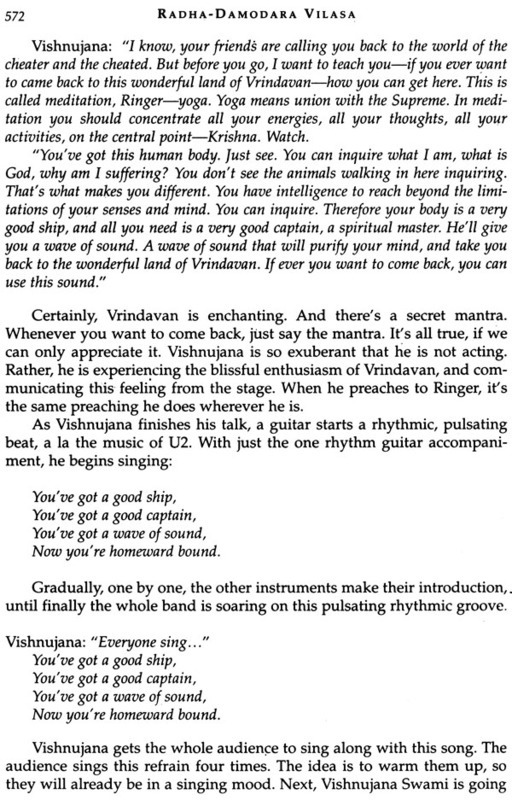 Vishnujana calls his bhakti-yoga presentation, Easy Journey to Other Planets, after the title of Prabhupada's first book. At the present, japa retreats have become popular for improving the chanting on beads. As you read Vishnujana Swami's realizations on japa back in 1973, after only five years of chanting, you will be astonished. His insights will bring you to a higher understanding of the culture, tradition, and daily practice of mantra meditation. In the early days of the movement, everything was progressing through spontaneous inspiration guided by Srila Prabhupada and Sri Krishna. People became inspired and acted on that inspiration. Prabhupada fanned those sparks of inspiration and gradually developed the devotional programs in his ISKCO society. Srila Prabhupada adopted quite a liberal approach with his young followers, as did his Guru Maharaja, Srila Bhaktisiddhanta Saraswati Thakur, before him. This liberal approach is in keeping with the most magnanimous incarnation ever, Sri Krishna Chaitanya Mahaprabhu. All great reformers and visionaries are liberal and thus they upset the status quo. Therefore, they are criticized by their contemporaries, the conservative class. 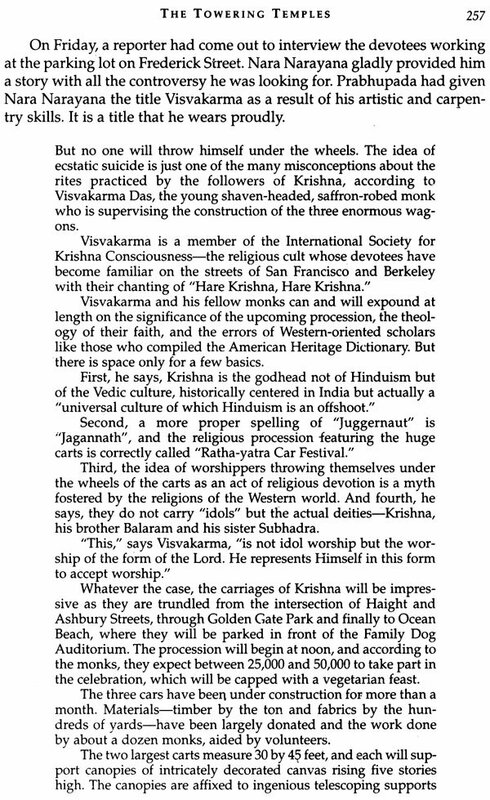 The criticism often crosses over to the realm of vaishnava-aparadha, and this clash between liberal and conservative is evident even in the ISKCON world. Srila Prabhupada explained during a class that poet Alan Ginsburg had commented, "Swamiji, you are very conservative." But Prabhupada did not agree. "No, I am the most liberal. You do not know. If I become conservative, then none of you will come to me." In San Diego, he elucidated further. "Conservative means unnecessarily you catch some rules and regulations without any meaning or without any utility. That is conservative. In Sanskrit it is called niyamagraha." In this volume, the sannyasi leaders of the Radha-Damodara party, Vishnujana Swami and Tamal Krishna Goswami, were so liberal that they could engage people in devotional service who otherwise might never have survived life in an ISKCON temple. You will read how some leaders lost their early enthusiasm and innocence. As their mood began to change, they increasingly strayed from the liberal transcendental vision given by His Divine Grace. 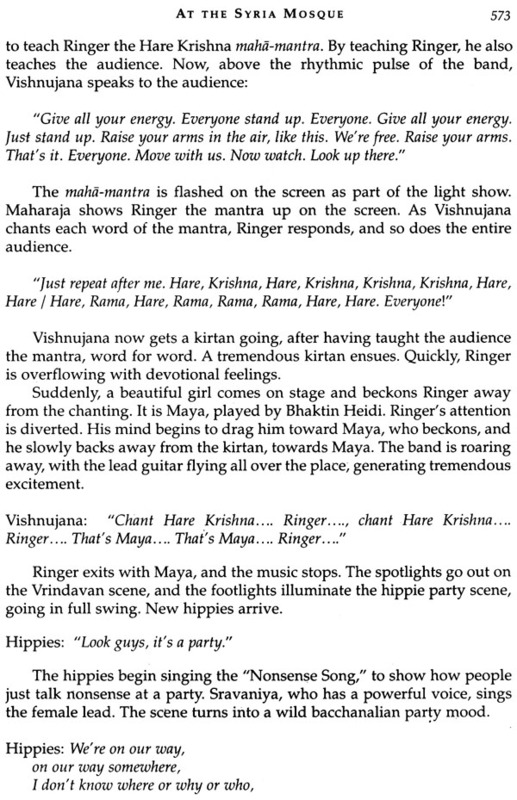 Towards the end of the book, it becomes clear that Vishnujana Swami is disturbed by something that makes him sad. Various people begin to notice this although they don't know why his mood has changed. The reader becomes an eye-witness to the development of Vishnujana's Krishna consciousness as he experiences different challenges, including his greatest challenge. Some readers may be disturbed by the actions of Tamal Krishna Goswami in this volume. Goswami was an intriguing personality, an empowered servant of Srila Prabhupada. Yet, he also had to overcome many challenges to achieve success in preaching as you will discover. The spiritual master is known to give both the "sweet sauce" and the "hot sauce." Tamal Krishna was frequently the recipient of Prabhupada's heavy side as well as his soft side. In his own dealings, Goswami used to dish out the "hot sauce" unreservedly in the early days. Some persons were the recipients of the "hot sauce" and their memories are included to present a balanced portrait of Goswami's character. Those who utilize the "hot sauce" shouldn't be surprised when others also use it. Although Tamal Krishna was a good person at heart, he acted in a heavy way to get results. And he did achieve results in preaching and management as you will see. Most people are followers and cannot accomplish what they need to do, therefore they require a strong leader to make them act. Some sannyasis are too soft and can't accomplish much because people take advantage of them. Sri-Sri Radha-Damodara arranged the perfect balance - Vishnujana Swami with the sweet sauce and Tamal Krishna with the hot sauce. The analogy of the lenient mother and the strict father is appropriate in this regard. Krishna is ultimately in control and both personalities needed to be involved to achieve what they did together. I hope nobody feels upset about the incidents in the narrative where Tamal Krishna Goswami acts in an unconventional way. He was aware of his own nature and has also recorded these events in his own writings. All activities performed in devotional service are on the absolute platform. I'm not writing this book to present material activities. Still, there may be an occasional reader who will think that his guru has not been sufficiently glorified. To such people I must emphasize that Radha-Damodara Vilasa is not written by a disciple glorifying his spiritual master. Rather, this is one of those rare manuscripts written specifically to glorify one's godbrothers and godsisters. As Advaita Acharya demonstrated, receiving the mercy doesn't always mean receiving praise. In the same vein, Srila Bhaktisiddhanta stated that people who pointed out his faults were actually his friends, not the ones who were continually glorifying him. Sri Vishnu uses the mace as well as the lotus flower. He is not only sweet. He also has His other side and can hit hard when it is deemed necessary. In the same way, all human beings have both sides as well. EVERY GENUINE MOVEMENT attracts persons who stand out by their acts of selfless sacrifice. Vishnujana Swami and jayananda Prabhu were two such persons in the Hare Krishna movement. Their spirit of humble service and commitment to spreading the glories of kirtan, the singing of the Holy Names of the lord, left an indelible impression on everyone who met them. Each became a legend in his own time. Vishnujana Swami was active in devotional service for only eight years and jayananda for only ten before they passed from our vision. They left behind no disciples, no books, no temples. This book is a humble attempt to properly glorify these outstanding devotees. The goal is to preserve their place in Vaishnava history so that succeeding generations may know of the important roles they played in helping Srila Prabhupada establish lord Chaitanya's mission worldwide. Although saintliness is rarely achieved, Vishnujana Swami and jayananda Prabhu seem to be acknowledged as saintly by the people who knew them. The personal memoirs in this book give us an insight into the character and personality of these two saintly personalities. Also of primary Significance in the book is the introduction of the Supreme lord and His eternal consort, who display Their childhood forms as Sri-Sri Radha-Damodara. The following discussion supports the observation that the advent and traveling sankirtan pastimes of Radha-Damodara were indirectly, but clearly, predicted in scripture just as the advent and sankirtan pastimes of Sri Chaitanya Mahaprabhu were indirectly, but clearly, predicted. The lord sometimes makes unscheduled visits as part of His sankirtan lila. In kali-yuga the lord again makes His own appearance, but this time He comes incognito, in the mood of a devotee. This advent of Sri Chaitanya Mahaprabhu is due to both internal and external considerations. The internal reasons, antaranga vicara, are for His own Divine Purpose. The external reasons, bahiranga vicdra, are for the benefit of the conditioned souls. Bringing His associates and the full paraphernalia of His transcendental abode, He reclaims the fallen souls and gives pleasure to the devotees by chanting His own Holy Name. He establishes the yuga-dharma, by personally inaugurating the sankirtan movement, and teaches the process of bhakti-yoga, or devotional service. Chaitanya Mahaprabhu's advent and lila are also described in the Sri Visnu-sahasra-nama, which appears in the Mahabharata. "In His early pastimes He appears as a householder with a golden complexion. His limbs are beautiful, and His body, smeared with the pulp of sandalwood, seems like molten gold. In His later pastimes He accepts the sannyasa order, and He is equipoised and peaceful. He is the highest abode of peace and devotion, for He silences the impersonalist non-devotees." In every town and village around the world My name will be sung. With this prophecy Lord Chaitanya reveals that He will come again, because there is no difference between Krishna and His Holy Name - kali-kale nama-rope krsna-avatara. In kali-yuga especially, Krishna descends as the sound vibration of the maha-mantra. Both the Holy Name, nama, and the possessor of the Name, ndmi, are one. Both are on the platform of eternal existence, eternal knowledge, and eternal bliss. This is the Absolute nature of Krishna and His Holy Name. This is further corroborated in the Chaitanya-bhagavat, Madhya-lila, Chapter 27, wherein the Lord informs His mother, Saci-mata, at the time of taking sannyasa, that He will descend two more times and that she will also accompany Him. He will appear in the form of the Holy Name, while she will appear as the tongue that vibrates the pure Name. Secondly, He will appear in the form of the Deity, and she will become the substance from which the Deity is formed. According to Vaishnava acharyas, the following verse from Srimad-Bhagavatam, wherein the sage Karabhajana discusses the yuga-avataras, is understood to predict Lord Chaitanya's appearance as the kali-yuga avatar. O Maha-purusa, I worship your lotus feet. You gave up the association of the goddess of fortune and all her opulence, which is most difficult to renounce and is hankered after by even the great demigods. Being the most faithful follower of the path of religion, You thus left for the forest in obedience to a brahmana's curse. Out of sheer mercifulness You chased after the fallen conditioned souls, who are always in pursuit of the false enjoyment of illusion, and at the same time engaged in searching out Your own desired object, Lord Syamasundara.